Karen used to see homeless people on the street and feel sorry for them, but never thought that she and her daughter would be in that position themselves. After all, she was a homeowner working a well-paying job and had established a stable life for her family. Everything changed when she was laid off from her job at a bank, where she had worked for 15 years. Karen had never expected to lose her job and was deeply depressed trying to find a new job—her old job had paid $23 an hour and every new opportunity seemed to pay only $8.25, which wasn’t enough to pay her bills. She was also limited in what jobs she could take because she needed the flexibility to look after her daughter, who has lived with a brain tumor since she was in 3rd grade. Thankfully the tumor isn’t life-threatening, but it causes severe and frequent headaches that prevent her from participating in a traditional school environment. It also means that she has to be closely monitored—and that Karen can’t work full-time unless it’s from home. Karen managed to find a part-time daycare job that brought in some money, but it wasn’t enough to pay her mortgage. After months of struggle and paying thousands to lawyers to try to save it, she lost the house that she had bought 11 years earlier to foreclosure. She loved the house and was close with her neighbors. She nursed her mother through her final days in that house. She was heartbroken to lose it. After losing their house, Karen and her daughter were forced to move from one hotel to another. Karen was determined to find a way to get back on their feet, so she searched for help online, found Nicholas House and was quickly accepted into our emergency shelter. Nicholas House provided them with a safe, stable place to place to stay, adult education classes that helped Karen gain budgeting and nutrition skills and case management that focused on interview skills, building savings and securing housing. Within a few months, they were able to move out of the shelter into their own apartment! Today, Karen is still interviewing for better jobs and has a plan in place to increase her income. She is proud that she has been able to set aside savings for her family and move into a home of their own. 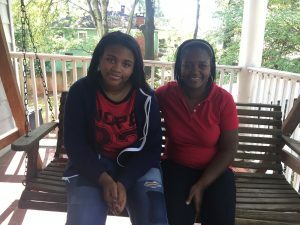 She is working hard to help her daughter get to where she needs to be and make sure that her medical and academic needs are taken care of – and Nicholas House is so glad to have helped her on her journey. 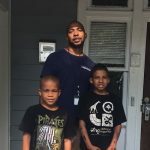 Dante lost everything when the nursing home where he had worked for 15 years shuttered its doors, leaving him without a job to provide for his wife and children.